After experiencing a series of dangerous--and frankly, humiliating--trials at Camp Half-Blood, Lester must now leave the relative safety of the demigod training ground and embark on a hair-raising journey across North America. Somewhere in the American Midwest, he and his companions must find the most dangerous Oracle from ancient times: a haunted cave that may hold answers for Apollo in his quest to become a god again--if it doesn't kill him or drive him insane first. Standing in Apollo's way is the second member of the evil Triumvirate, a Roman emperor whose love of bloodshed and spectacle makes even Nero look tame. 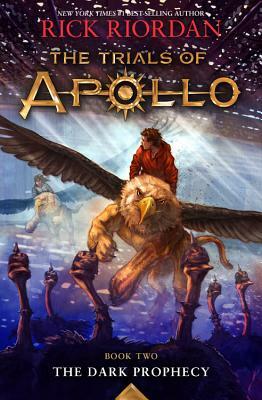 To survive the encounter, Apollo will need the help of son of Hephaestus Leo Valdez, the now-mortal sorceress Calypso, the bronze dragon Festus, and other unexpected allies--some familiar, some new--from the world of demigods. Come along for what promises to be a harrowing, hilarious, and haiku-filled ride. . . .
Rick Riordan, dubbed "storyteller of the gods" by Publishers Weekly, is the author of five #1 New York Times best-selling middle grade series with millions of copies sold throughout the world: Percy Jackson and the Olympians, The Heroes of Olympus, and the Trials of Apollo, based on Greek and Roman mythology; the Kane Chronicles, based on Ancient Egyptian mythology; and Magnus Chase and the Gods of Asgard, based on Norse mythology. Rick collaborated with illustrator John Rocco on two #1 New York Times best-selling collections of Greek myths for the whole family: Percy Jackson's Greek Gods and Percy Jackson's Greek Heroes. Rick lives in Boston, Massachusetts with his wife and two sons. Follow him on Twitter at @camphalfblood. "A clash of mythic intrigues and centuries of pop culture to thrill die-hard and new fans alike." "Riordan's characters continue to be an impressively diverse group. . . . This latest has Riordan's signature wry narration, nonstop action, and mythology brought to life. A must-buy. . . ."